In my new series, Squarespace 101, I'll be showing the basics of using the platform with step-by-step tutorials. In this first one, I'm teaching you how to create and publish a blog post. Once you've logged into your account, click on the pages tab at the top of the navigation menu on the left side. From there click on the blog link in the menu. Depending on how you've named and ordered your navigation, it might not be at the bottom like mine and it could be named differently. At the top right of the navigation menu there will be a plus sign. Click on that to create a new blog post. When you add a blog post, the following box will pop up. In the first field add your title. Below that start writing your post. In future tutorials I will show you how to add an image, but we'll keep it easy today. 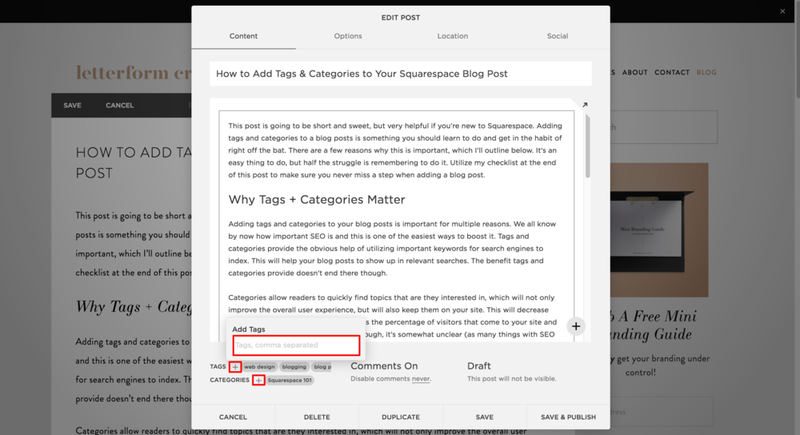 Once you've finished writing your post, add tags and categories in the bottom left. In the future Squarespace will remember categories that you've used before and allow you to choose from them. 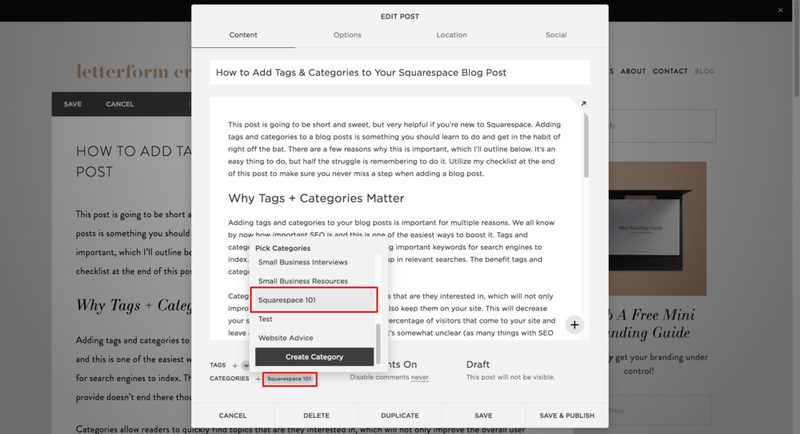 The categories will be helpful for visitors who want to search your blog posts by a certain category, while the tags are useful for search engine optimization. Be sure to use any terms you think people will google when searching for the content your posting. After you've added those click the Save & Publish button in the bottom right corner. Congrats! You've officially published your first blog post. Stay tuned for more Squarespace tutorials!